One of the greatest things about cruising is that it offers a chance for international travel, without many of the headaches. There’s no need to change currencies. There’s no need to learn another language (English is spoken in ports). And there is no need to get a passport. But despite not requiring a passport, it is something that you should have. There are simply too many situations that may arise that would be more difficult to deal with if you don’t have one. That’s why we’ve put together this guide to passports and cruising. We’ll answer some of the biggest questions and concerns regarding getting your passport and explain everything in simple detail for first-time cruisers. Can I Cruise Without a Passport? First things first. Most people can cruise without needing a passport. If you are sailing a “closed loop” cruise — meaning you depart a U.S. port and return to that port to disembark — then you don’t need a passport. As we said, this covers most cruises. 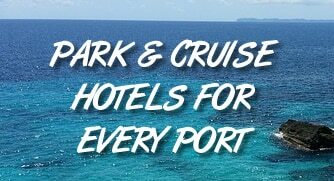 What it doesn’t cover is if you travel to a country that requires a passport (most Caribbean ports do not) or if you are not sailing on a loop, such as sailing from Miami and departing in Puerto Rico. The obvious reasons for having a passport are if you are not sailing on a closed-loop cruise or heading to a port that requires it. But apart from that, you should view a passport as an insurance policy. The closed-loop rule only works if you depart and arrive back at the same port. If you accidentally miss the ship or are hurt/sick on your trip and can’t continue, then having a passport is a lifesaver. In these cases, you’ll have to jump through hoops to try to fly back home later without a passport. Having one ensures that even if something unexpected happens, then you have the proper documentation to move about the country and re-enter the United States by land, sea, or air. It also helps to prove your identity if there is a mishap while on shore. If you are in an accident or have any other interaction with police while in a port of call, they will likely ask for your passport. Having one takes out any questions that can arise regarding your identity and legality of being in the port of call. Should I Get a Passport Book, Card, or Both for a Cruise? Getting a passport isn’t that difficult, but it can be a bit of a hassle as there are several steps to take. To start, you will need to know whether you want a passport book, passport card, or both. The passport book is the regular passport that you’ve seen before. It has pages in the back that are stamped upon arrival in a country. The passport card is like a driver’s license. While the book is valid for entering most countries by any means of travel (air, sea, or land), the passport card is only valid for only return to the U.S. by land or sea from Canada, Mexico, Bermuda, and the Caribbean. You can also get both the passport book and card for an extra fee. Once you decide which type of passport you’d like, you’ll need to gather the appropriate documents. Second, you will need to submit a photocopy of your citizenship evidence. (The government will inspect the original document and return it to you, keeping the photocopy.) Just make a simple one-sided, black and white photocopy of your document on standard paper. Third, you need a photo ID from a government agency. This is most likely a driver’s license or a government-issued ID card. If you have a passport (even if expired), that works as well. Fourth, you will need a photocopy of the front and back of the ID you plan to show the passport office. Fifth, you need to fill out Form DS-11 (if this is your first passport). Take note to fill it out but do not sign until in front of the passport agent. Finally, you’ll need to take passport photos. You can take photos at tons of places, from grocery stores to drug stores to many mail centers. Simply give the places a call to see if they offer the service. Most charge a nominal fee of $5-7. Once you have all your documentation, then you’ll need to submit it in person at a Passport Acceptance Facility. These facilities are typically local post offices. You can search for your nearest facility here. Keep in mind that some facilities are by appointment only. You can see their hours of operation on the search results. How Much Does Getting a Passport for a Cruise Cost? First-time passport books costs $110, plus a $25 acceptance fee, for a total of $135. Passport cards cost $30, plus the $25 acceptance fee, for a total of $55. If you want both the book and the card, it’s $140, plus the $25 acceptance fee, for a total of $165. How Long Does It Take to Receive a Passport? Can I Get It Faster? Standard processing time for a passport takes 4-6 weeks. If that cuts it too close to your cruise date, there are ways to speed up the process. First, you can simply pay for expedited processing. This is an extra $60 charge and your passport will process in 2-3 weeks. Need it even sooner? You can apply for your passport at a passport agency, located in major cities around the country. To apply here, you need to setup an appointment, pay the expedited fee, and have proof of immediate travel. Applying for your passport with this method takes approximately 8 days. If you need a passport immediately, most medium to large cities will have businesses that expedite the process — some claiming within 2-3 days. Simply search for your city name plus “passport” in Google to find companies in your area that offer expedited service.